WASHINGTON, DC, December 5, 2017 (ENS) – President Donald Trump Monday signed proclamations to shrink the boundaries of two national monuments in Utah – Bears Ears National Monument and Grand Staircase-Escalante National Monument. The proclamations result in five distinct monument units within the two monuments. 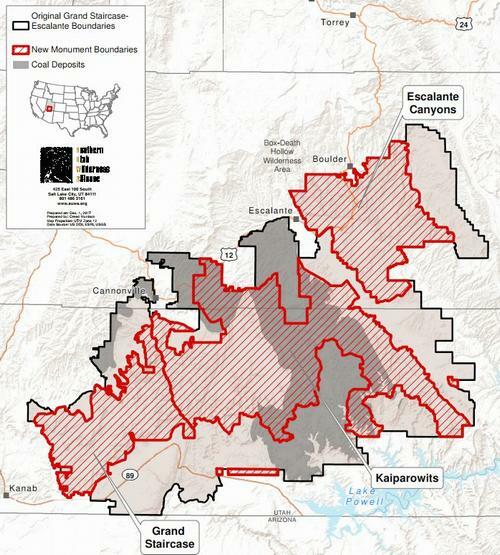 Conservation groups and native American tribes warn that by shrinking these national monuments, their cultural, paleontological and wilderness resources will be left exposed to oil, gas and coal leasing and development, as well as the location and development of new uranium mining claims. 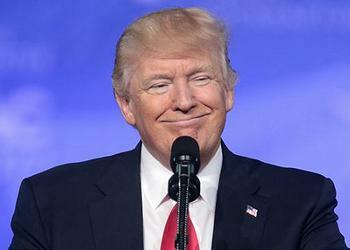 They have gone to court to try and block Trump’s move, saying he has illegally overreached the power of the presidency. “No one values the splendor of Utah more than the people of Utah – and no one knows better how to use it. Families will hike and hunt on land they have known for generations, and they will preserve it for generations to come.” said President Trump, announcing the shrinking of these monuments in Salt Lake City, Utah. National monuments protect “existing rights,” meaning, whatever people did there before it was protected as a national monument, they can probably still do after it is designated. This includes previously existing: oil and gas leases, access to private property, valid mining claims, roads and utility infrastructure and livestock grazing. Bears Ears National Monument, located in San Juan County in southeastern Utah, was established by President Barack Obama by presidential proclamation under the Antiquities Act on December 28, 2016. The monument protected 1,351,849 acres of public land surrounding the Bears Ears, a pair of mesas. President Trump’s proclamation reduced its size by 85 percent to a total of 201,876 acres divided into two monument units. The Grand Staircase-Escalante National Monument protected 1,880,461 acres of land in southern Utah, the largest land area of all U.S. National Monuments. President Bill Clinton designated the area as a national monument in 1996 using his authority under the Antiquities Act. Trump’s proclamation reduces the monument’s size by almost 50 percent, with the remaining land broken up into three separate areas. 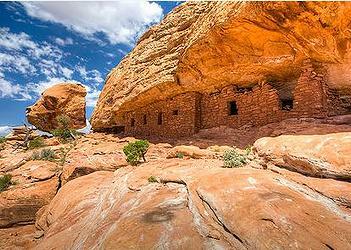 Representatives from the Hopi, Zuni, Ute Mountain Ute, the Navajo Nation and the Ute Indian tribes accused Trump of exceeding “the limited authority delegated to his office,” violating “the Antiquities Act and the separation of powers established in the Constitution” and circumventing the law by “attempting to evade that strict limitation” of his power. The lawsuit, the first against Trump’s decision to shrink the monument, was filed at the same time that a group of environmental organizations sued Trump and Interior Secretary Ryan Zinke for slashing Utah’s Grand Staircase-Escalante National Monument, attacking the proclamation as an abuse of the president’s authority. 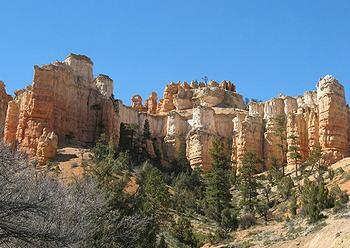 Earthjustice is representing eight organizations in a suit charging that the president violated the 1906 Antiquities Act by stripping monument protections: The Wilderness Society, the Grand Canyon Trust, the Sierra Club, Defenders of Wildlife, Great Old Broads for Wilderness, Center for Biological Diversity, WildEarth Guardians and Western Watersheds Project. 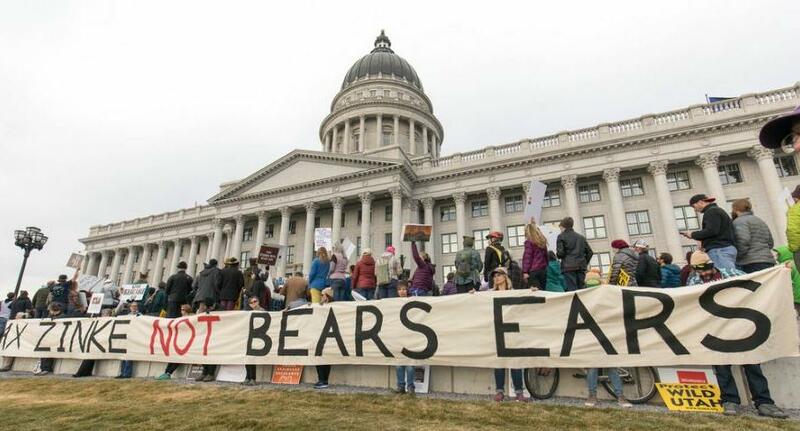 The Southern Utah Wilderness Alliance and Natural Resources Defense Council are co-plaintiffs in the lawsuit and are represented by in-house counsel. “President Trump has perpetrated a terrible violation of America’s public lands and heritage by going after this dinosaur treasure trove,” said Heidi McIntosh, managing attorney in Earthjustice’s Rocky Mountains office. Grand Staircase holds one of the richest collections of fossils from the Late Cretaceous Period, which gives scientists and the public alike an unparalleled window into the dinosaurs that lived in these lands 10 million years ago. In mid-October, scientists airlifted one of the most complete tyrannosaur skeletons ever found out of Grand Staircase. These fossils are found in the Kaiparowits Plateau, where the coal industry has long coveted access for coal mining that would wreak havoc on this dinosaur treasure trove that belongs to the American people. “I’m a resident of Kanab, and there are a lot of local businesses that are completely dependent on tourism related to Grand Staircase-Escalante,” said Laura Welp of Western Watersheds Project, and a former botanist at Grand Staircase-Escalante National Monument with the Bureau of Land Management. “The entire staircase of spectacular geological layers, with its world-class fossil resources, deserves to be protected intact from the threat of coal mining and other types of commercial exploitation,” said Welp. Trump’s executive order to shrink Grand Staircase-Escalante National Monument followed a review conducted by Secretary Zinke. Over 2.7 million Americans voiced their support for national monuments across the country, and public participation in the comment period was overwhelmingly in favor of keeping these public lands and waters protected just as they are. President Bill Clinton protected the lands of Grand Staircase as a national monument on September 18, 1996 using the Antiquities Act, a century-old law that has been used by 16 presidents since Theodore Roosevelt to protect some of our nation’s most cherished landscapes and cultural heritage. Congress enacted the law in 1906, granting presidents the authority to create national monuments on federal lands to protect significant natural, cultural, historic or scientific features. The Antiquities Act does not, however, grant presidents the authority to diminish or rescind the monument designations of their predecessors.